I woke up at 4:20, 11:00 and finally got up at 11:20. The room we had was really very nice especially with the private patio (left door). The five steps down to the large bathroom warned you to stay sober. By 11:55 I was repeating my run down the same road I did yesterday. I got back at 12:30 and immediately jumped in the pool for a very refreshing swim. I got out at 1:00 and got a shower and packed up and loaded the car which we were able to drive right to our room. I checked out of the hotel at 2:00 (upper right). I then went and looked at the common rooms upstairs in the main building. I took my computer to the courtyard and they made me a nice cappuccino and with a map I made plans for our later travel through the east side of France. At 2:55 Marcia drove the short distance to St-Rémy (2 mi) and when we arrived in the center of the old town at 3:00, Marcia was ready for lunch. We walked around for quite some time looking at all the shops and meal alternatives and passed by the St-Martin's Church (lower left). It looks like the US Supreme Court. There were many interesting windows to browse. St-Rémy is famous for two things. In 1503 it was the birthplace of Michel de Nostradame better known as Nostradamus, famous for his prophesies. 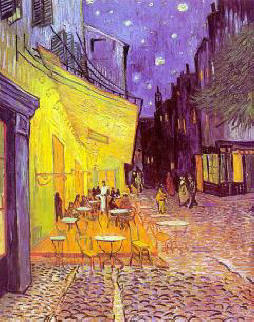 In 1888, Vincent Van Gogh moved to Arles in hopes of turning the tawdry town into an art enclave. He begged his friend, Paul Gauguin to join him, which he finally did in October. They haunted the Café de Nuit, made famous by them but Gauguin hated Arles and wanted to leave. In a rage, Van Gogh challenged him with a knife in the Place de Forum but Gauguin stared him down. 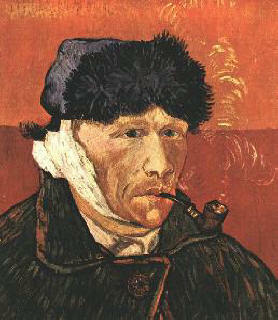 Van Gogh ran back to his room in shame and cut off his ear. He later admitted himself to the mental institution here in Arles, for which the town was very much relieved. He transferred to the asylum in St-Rémy and died here a year later. We went down these tiny little streets chuck full of shops and finally learned that "Petit Casino" was not a small gambling hall but rather a little place where you can buy fresh fruits and vegetables. After we walked around the street that circles the old town, we headed into the small center and discovered their interesting method of draining water. It was fascinating to watch the water racing down these little troughs like canals. I worked on the computer for a while and then decided to go explore a little. As I walked across the street I noticed an unusual art museum and gallery with statues in the courtyard in front of the door. It was called Musée Jouenne, Galerie de l'estelle (gallery of the stars) [20 boulevard Mirabeau]. It houses many works by Michel Jouenne, who is famous but I had never heard of. I went inside and saw some interesting works. I then went back and joined Marcia. When we were finished with Marcia's lunch, the waiter brought us another couple's check which was a lot higher than ours. He kindly corrected the mistake. Its always good to take a look before you pay. At 3:30 we strolled a little more and I couldn't resist the temptation to buy a couple of pain d'chocolat at one of the boulangeries for the road. It was finally time to head out, so we got back to the car and at 4:00, Marcia drove from St-Rémy southwest past Glanum, Les Baux and Paradou to the city of Arles which took only 30 minutes. 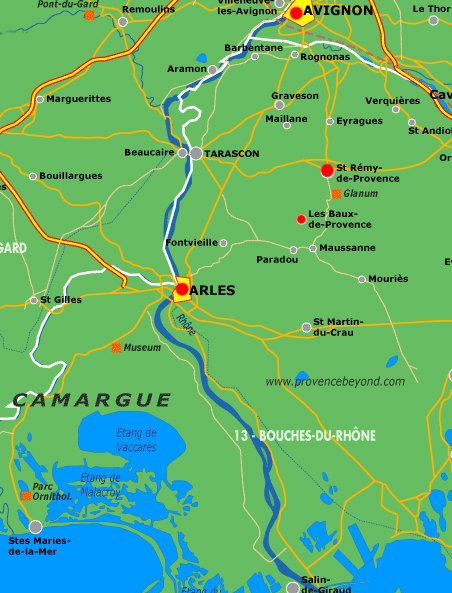 From the map (left) you can see that Arles is the major city just above the Camargue and the Bay of Vaccarés. We are now in the region called Bouches-du-Rhône. 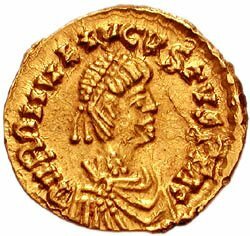 In Roman times, Julius Caesar made Arles a major seaport because he wanted to punish Marseilles which had sided with Pompey against him during the civil war. Over the centuries it silted up so that it is now far inland. The Camargue is a very wild area popular especially for those liking to go horseback. We never got to go there. To learn more about it, click the word. Map courtesy of Provence Beyond. Red dots denote cities we visited. As we drove, we saw many fields of sunflowers just like we saw in Italy. As we approached the city "gate", we could see this special building at the tip of an intersection with the picturesque Amadieu Pichot fountain inaugurated in 1887. The streets kept getting thinner and thinner as we followed the GPS system to our hotel. We came to an area where the roads were blocked off with police manning the blockades. It took some talking to them to let us pass through. There were a lot of little tiny streets (photo left) to navigate but we finally came to point where we had to go down a one-way street on what looked like a pedestrian street. A car came in the other direction and we backed up and then proceeded around a turn and lo and behold we found it. It was right next to the pedestrian section and the Place de Forum. At 4:30 we arrived and checked into Hotel d'Arlatan [26 rue du Sauvage , +33-(0)4-90-93-5666]. They gave us room #53 in the annex building. What a beautiful old hotel this is and its history goes back to the 12th century when the name of the Counts of Arlatan appeared for the first time in the town archives of Arles. In 1448, Jean d'Arlatan, who was intendant of the great King Rene, killed the monster that was devastating the fields of kermes oak where vermilion was collected. As a result, the knight received the title of Count of Arlatan of Beaumont and the privilege of the vermilion harvest. In addition, to honor him, King Rene entrusted Jean d’Arlatan with the supervision of the excavations to find the relics of the Saint Maries, lost since the 5th century. In the 19th century, the name of Arlatan disappeared completely, for lack of a male descendant, and the mansion was given to a notary. In 1920, part of the old house was purchased for a hotel. For four generations the hotel has belonged to the same family. We had a long trek from the front desk, through all the common lounge areas, past the dinning rooms and to the patio to finally get to the courtyard out back where the annex building is. We noted all the photographs on the wall and later found out that this hotel is where the founding of the Photography Festival was held in 1970. 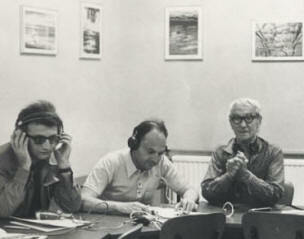 It was then that Lucien Clergue, Jean-Maurice Rouquette, and Michel Tournier created the International Photography Festival (Rencontres Internationales de la Photographie) [photo below right]. This event became the first photography festival ever held in the world and has always been associated with Hotel d’Arlatan. The patio area is a very enchanting place to have your breakfast. I was fascinated by the large turtles in the central fountain. They were the same size as the ones I had bought several years ago for our koi pond and they all escaped and went for a stroll down San Vicente Blvd never to be seen again. I guess these walls were high enough to keep them in. Below right is the annex building and our room is on the 3rd Floor. Luckily, since the building is new, there is an elevator. The pool is nearby on the left in the enclosure with the umbrellas. Here is an example of taking a photo of a sign (the historical marker on the hotel) and then manipulating it using Adobe Photo Deluxe so that it looks like you are looking at it straight on. At 7:00 we went from our hotel to a main plaza nearby called Place du Forum. 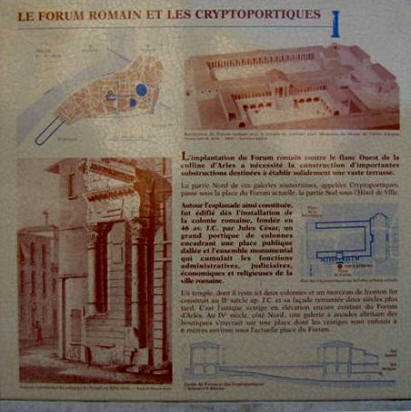 The Place du Forum was once the center of the Roman city. Today it is the heart of Arles - a square shaded by plane trees. The square is lined with 17th and 18th century mansions which have now been converted to hotels. This is where Van Gogh, in a rage, challenged Gauguin with a knife and Gauguin stared him down. 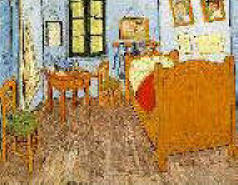 Van Gogh then ran back to his room (below center) in shame and cut off his ear (below left.) He later admitted himself to the mental institution here in Arles, for which the town was very much relieved. We wandered around the large plaza bordered and centered by shops and awning-covered cafes and bars. It was getting hot so we thought we would have a drink. We sat down at Le Bistrot Arlésien and watched the water mist spraying (below right) from the edges of the umbrellas and from the front of fans to cool people off. See the spray coming off the fan? I had a Leff (another French local beer) and Marcia wanted to try the local specialty called Pastis. We both thought it was terrible and I didn't like the Leff beer and since the staff was a little snooty, we decided to move on. Before we left I took a little walk around the plaza to see if I could get a free WiFi connection, but I had no luck. I discovered behind all the umbrellas, in the center of the plaza was a statue of Frédéric Mistral, who in 1854 wrote a series of poems in the medieval form of the Provencal language. These poems brought back the dialect that is spoken today. In 1896 he wrote the Provencal dictionary and in 1904 won the Nobel Prize for literature. We decided to look at the map and explore this city. We headed down one of the tiny streets toward the coliseum and the streets were full of life with many people meandering about. We came across the Eglise (church) St-Julian hidden among the other buildings. The twisted columns on this door were quite unusual. We then came across the old hospital of Arles, the Hôtel Dieu, where Van Gogh spent time. This is his painting of the inside of the asylum. It now houses the recently created Espace Van Gogh. 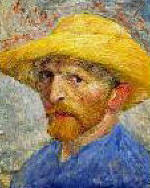 He created many works of art while he was here like his autumn fields outside of Arles. None of his works are housed in the city of Arles. We noted the method they use here to keep you from parking on the sidewalk. 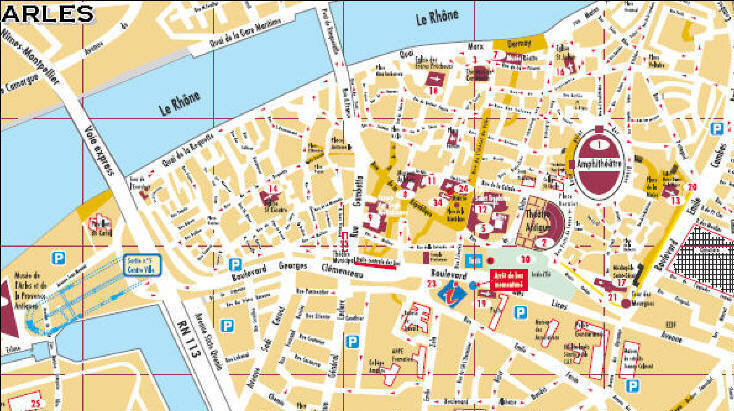 We turned the corner and found Place de la République, a central plaza of Arles. The center is dominated by a huge obelisk with a fountain at the base. The building just behind the obelisk (center) is St-Trophime, their cathedral. The building with the flag is the Hôtel de Ville or City Hall. Everywhere you went they had this magazine cover posted. Were they trying to sell watermelons? We then walked up by the Ancient Roman Theater but it was closed for the day. So we continued up the hill to find the coliseum. Les Arènes is a Roman amphitheater that dates to 80 AD or the reign of Hadrian. This coliseum-like arena was once able to seat 20,000 people for gladiator events. 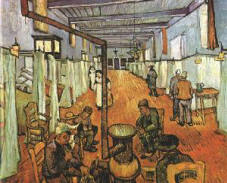 Van Gogh's "Arenes" below. The arena was used in medieval times as a fortress to protect the townspeople from attacks. Today the arena is used for French bullfights (corridas) in which the bull is not killed. This Roman coliseum was in very good shape and it was large (446 ft [136 m] long and 351 ft [107 m] high). With its bleachers it can seat 24,000 people. It has 60 arches, the upper with Doric columns and the lower with Corinthian. As with most other such structures, its marble was removed to build houses. It was renovated in 1825. One part of it was all covered up for restoration but the rest was really nice. We then wandered up to another church and got a chance to look out over the city. We walked back through the crowed streets with all the vendors and noted these interesting shirts for sale. These little oils were cute. As we wandered through the tiny streets of Arles, we noted this woman selling paella from a large cooking pan. It looked so good I wanted to try it but we didn't. At 8:00 we crossed the large main street of Blvd rue Georges Clemenceau and discovered this very nice little Irish Pub called Paddy Mullin's Pub. I naturally had a Guinness and Marcia a glass of Chardonnay. After relaxing and enjoying the ambience, we headed out trying to figure a place to eat. We looked at many opportunities for dinner, including Nor-Pinus [Nord-Pee-nus] (center). We were very tempted to go to this very fancy place on the Boulevard called Loy Marques in Hotel Jules Cesar but after looking inside, I decided we needed to try someplace else. 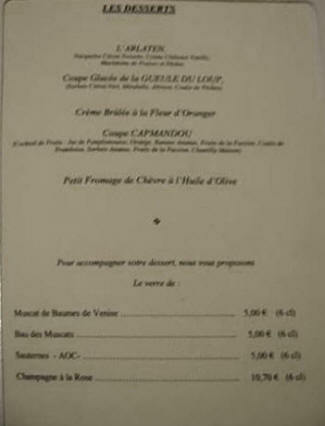 After multiple possibilities, at 9:45 we finally tried to go for dinner at La Gueule du Loup [39 rue des Arénes, +33-(0)4-90-96-9669]. They had one table left. The lone table was at the foot of the stairs to the main dining room upstairs. I decided to go up and see how it looked up there. It was very nice but full (below right). The waitress got her exercise navigating those stairs from the kitchen a hundred times. There's our empty table at the end of the stairs (left). On the way back I noted the many large photos of bull fighters on the wall. They have both French and real Spanish bull fights at the main Roman Arena here. Our table was right next to the kitchen and we were able to strike up a conversation with the Chef-owner. As we watched him hectically and smoothly prepare all the dinners (including ours) he told us his greatest pleasure is riding his horses in the Camargue (see above). I noted that at the corner of the overhead exhaust fan there was this little red caricature that appeared to be beating his chest. I forgot to ask the Chef why it was there. His wife attended to us and we started with splitting a vin péche (peach wine) and a large bottle of Pellegrino. 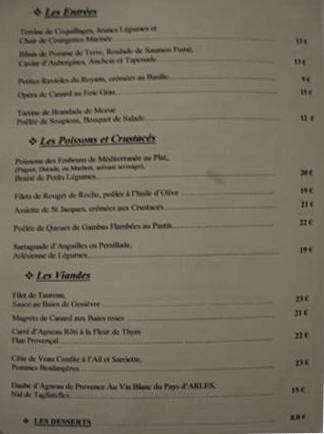 For wine we ordered a Vin de pays des Bouches-du-Rhone, a local wine called Mas Valériole 2002. I decided to try the famous dish called Petites Ravioles du Royans crémées au Basilic which are tiny little spinach raviolis in a cream sauce. It was fabulous. I was willing to try it again. For a main course I had Daube d'Agneau de Provence Au Vin Blanc du Pays d'Arles which is pieces of lamb with a ball of fettuccini and a cold pâté of carrot (below left). Marcia had Poissons des Embruns de Méditerranée au plat aux Braisé de petits légumes which is Durad fish with a small dollop of rice accompanied by a little carrots and zucchini (as you know petite means small.) We enjoyed both dishes. Dessert for me was de Baumes de Venise similar to a custard with berries and a glass of Muscat. Marcia had Petite Fromage de Chévre à l'Huile d'Olive, a special goat cheese she likes very much (below right). As we were finishing our dessert, a very nice French couple were leaving and asked me if we would like to have our picture taken. We said OK. It was very nice of him. So far, we have been treated very nicely by the French wherever we go. At 11:50, we left the restaurant very satisfied after a fabulous meal. We wended our way back to the hotel and I asked the woman at the desk if she would book our hotel for the next night and she said she would try. I got back to the room and worked on diarios and got to bed at 3 AM. A very long tiring day.